The Commerce Department said the pace of construction spending declined in December, the fourth dip in seven months. Compared to December 2017, though, money spent on building projects rose 1.6% to an annual rate of $1.29 trillion. Residential construction spending declined from November and from the year before because of slower spending on single-family housing. More money has been going to the building of multi-family residences. In a sign of weakening consumer spending, motor vehicle sales fell in February to their slowest rate since mid-2017. Data from the Bureau of Economic Analysis show an annual sales pace of 16.5 million light trucks and cars in February, down 0.9% from January and down 2.3% from the same time last year. Over both periods, the number of cars sold declined while light trucks sold faster. The pace of new home sales quickened in December, although it remained below year-ago levels. The Commerce Department said full-year 2018 sales reached 622,000, which was 1.5% more than 2017. New home sales were down about 13% from their post-recession peak In November 2017. They’re less than half of what they were at their peak in 2005. The median sales price fell 7.2% from December 2017, the fifth decline in seven months. The non-manufacturing sector continued to expand in February for the 109th consecutive month. The ISM non-manufacturing index quickened after two months of slowing. All 18 industries surveyed by the Institute for Supply Management said their business was growing. Although they expressed optimism about economic conditions, they also said they have concerns about trade policy uncertainty, capacity constraints and employment resources. 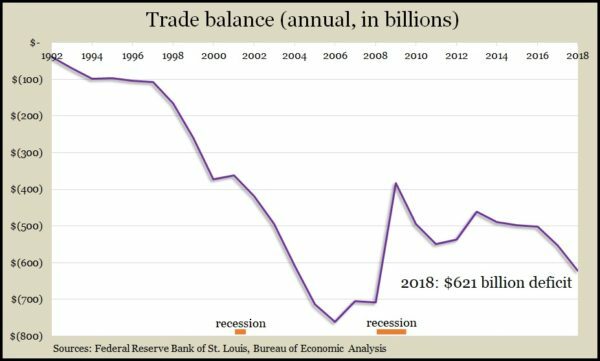 The U.S. trade deficit widened 18.8% to $59.8 billion in December, the biggest monthly gap since October 2008. The Bureau of Economic Analysis said exports fell 1.9%, while imports rose 2.1%. For the year, the level of net exports dropped to a negative $621 billion, down 12.5% from 2017 and the greatest deficit since the recession and financial collapse in 2008. Excluding services exported from the U.S., the goods deficit reached a record $891 billion. Analysts blamed the strong dollar amid slowing global economic growth. The four-week moving average of initial unemployment claims fell for the second week in a row. Jobless applications were 36% below the 52-year average, which hasn’t been crossed in more than six years, according to Labor Department data. Demand for workers should build pressure for higher wages and increased consumer spending, which drives about two-thirds of U.S. economic activity. The Bureau of Labor Statistics reported that productivity grew at an annual pace of 1.9% in the fourth quarter of 2018, up from 1.8% in the third quarter and down from 2.8% in the second quarter. The latest productivity estimate resulted from a 3.1% rise in output and a 1.2% gain in hours worked. For all of 2018, productivity averaged 1.8%, the highest since 2009. Since 2007, the average was 1.3%, vs a 2.2% pace since 1947. The Federal Reserve reported that growth in credit card debt rebounded in January, suggesting that Americans were more comfortable spending. So-called revolving credit expanded at an annual pace of 2.9% from December, up from 1.1% in December, but down from 5.5% in November and more than 12% in October. The bulk of consumer credit—non-revolving credit, including student loans and automotive financing—rose by an annual rate of 5.9% in January. U.S. employers added 20,000 jobs in February, below analyst expectations and a fraction of the 223,000 average from 2018. Even so, February marked the 101st consecutive month of job gains, another record, according to the Bureau of Labor Statistics. Payroll data showed that for the fifth month in a row average hourly wages rose more than 3% from the year before. In the same report, the bureau said that the unemployment rate dropped to 3.8% from 4 % in January, hovering around the lowest levels in 50 years. The Commerce Department said the pace of housing starts picked up in January after a slowdown in December attributed to bad weather and wild fires in California. The annual rate of 1.23 million residential units to begin construction in February was the highest since May, though still less than half the peak in 2006. Single-family houses led the recovery in February. Building permits also were issued at a faster rate, but multi-unit complexes led the increase.